HIDALGO — When Yahoo reporter Shams Charania tweeted Tuesday morning that Troy Williams was expected to be released by the Houston Rockets, the word reached Williams almost instantly. A few hours later, Charania tweeted that Williams was staying with the Rockets after further discussion between the two parties. And a few hours after that, Williams scored 28 points with 10 rebounds, four assists, three steals and no turnovers to propel the RGV Vipers to a 132-121 win against the Oklahoma City Blue at State Farm Arena. Houston will be forced to make a roster move to accommodate the impending addition of Joe Johnson, and the Rockets are still working through that decision, per Charania’s tweet. Williams is one of three Rockets assignment players on the Vipers roster, along with Zhou Qi and Chinanu Onuaku. Despite the whirlwind of activity, Williams said he hasn’t spent any time thinking about his status with the organization. “That’s what agents are for,” Williams said. Brase and Williams both said they were unsure of Williams’ future with the team. Williams was aggressive attacking the basket on Tuesday, hitting 10 of 11 shots from inside the arc. He also hit 5 of 6 at the free-throw line, and he said he has been focused on driving to the rim since returning from an MCL sprain on Jan. 19. RGV dominated the game on the interior, outscoring Oklahoma City 66-32 in the paint and owning a 56-41 advantage on the boards. Isaiah Hartenstein finished with 16 points and 13 rebounds, and Chinanu Onuaku also posted a double-double of 13 points and 12 rebounds. Tony Wroten led RGV with 12 assists and four steals in addition to nine points. The Vipers scored the game’s first six points and never trailed. RGV stretched the margin to double digits for the first time when Hunter hit a 3-pointer on the first play of the second quarter to make the score 39-27, then went on an 11-0 run over just 1:53 of game time to extend the advantage to 23 points at 52-29 with 9:05 to play in the period. At the halftime break, RGV’s lead was 69-53. The Vipers’ largest lead was 29 points early in the third quarter, and Oklahoma City closed to within 15 points by the end of the period. The Blue pulled within 10 multiple times during the fourth quarter, but R.J. Hunter protected the Vipers’ lead with 3-pointers at 2:27, 1:47 and 1:22 of the fourth quarter. Hunter finished with 26 points. Because of RGV’s comfortable lead, Hunter had not played in the fourth quarter before checking in with 3:17 to play. With RGV entering a break before the team’s next game Feb. 23, Hunter said trying to lock back in mentally was a challenge. The win was RGV’s third straight and lifts the team’s record to 23-17 — in the thick of the playoff race in the Western Conference with 10 games remaining. Oklahoma City’s loss drops the Blue to 20-17, tied with the Sioux Falls Skyforce for first place in the Midwest Division. Whichever team does not capture the division title could be competing with the Vipers for one of the conference’s three wild-card spots. The Reno Bighorns (20-16) and Santa Cruz Warriors (19-17 entering their game Tuesday) figure to be in the wild-card mix from the Pacific Division, provided the South Bay Lakers (23-14) maintain their division lead. In the Southwest Division, the Vipers will contend with the Austin Spurs (24-14) and Texas Legends (22-16) for a division title and wild-card positioning. The G League’s all-star break begins today and runs through Feb. 21. 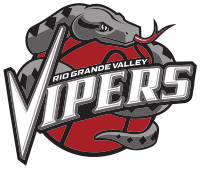 RGV is next in action Feb. 23 against the Iowa Wolves as part of a two-game road swing before the Vipers’ next home game March 6 against the Fort Wayne Mad Ants.